Look here for Coffee Maker parts and accessories. We have a wide variety of coffee maker carafes, heating elements, filter baskets, and lids on hand. 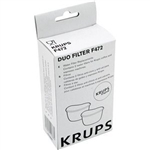 Krups Duo Filters for Coffee Makers (Pair) 472-00. Original Krups filters restore proper flow and flavor to your coffee maker. Krups KM1000 Replacement carafe and Lid MS-621696. This coffee carafe and lid for Krups km1000, KM100 series coffee makers. Braun Tassimo Piercing unit fits Braun Tassimo models. This is NOT for Bosch Tassimo models. The Piercing unit for Braun Tassimo units fits Braun Tassimo models TA1000, TA1050, TA1080, TA1100, TA1200, TA1300, TA1400, TA1600, 3107. Original Braun Tassimo piercing unit is OEM old stock (these were discontinued some years ago. These are likely the last unsold stock anywhere. Buy while they last! This grey plastic piercing unit will get your Braun Tassimo machine back in brewing shape because it is the original Braun manufactured part. Limited supply. Krups KM730 Replacement coffee carafe and Lid SS-201555. This coffee carafe and lid for Krups KM730D50 coffee maker. Krups Artese Filter for Espresso / Capuccino Makers 088. Original Krups filter restores proper flow and flavor to your espresso maker. 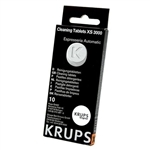 Krups Cleaning Tablets for Espresso Makers (10) XS3000. Original Krups cleaning tabs restore proper flow and flavor to your espresso maker.